Although it was never as popular as some of the biggest comedy hits in the history of television, Arrested Development is widely considered to be one of the funniest, smartest and most entertaining comedies ever to grace TV screens. Though the show, which was created by Mitchell Hurwitz, only ran for three seasons on the FOX television network, it has become one of the most influential, as well as one of the most quoted shows in recent memory. Arrested Development follows the lives and mishaps of the Bluth family as they try to make sense of their lives after the patriarch of the family, George Bluth, Sr., is arrested shortly after announcing that the leadership of the family company will go to his wife, the cunning and sarcastic Lucille. This angers son Michael, who had assumed that he would be given the reins to the company after his father stepped down. Other characters on the show include GOB ? short for George Oscar Bluth, George Michael Bluth ? Michal's son, Lindsay and Tobias Funke, Buster Bluth and Maeby Funke. Each member of the family has distinctive and hilarious traits which are often used to great comedic effect. Additionally, the relationships between the family members take on altered meanings as the show progresses and more information is revealed about them and their histories. Unlike many other television comedies, Arrested Development uses a structure that rewards viewers for multiple viewings. Each episode is packed with hundreds of jokes. Many of them come from the dialogue spoken by the characters, but there are just as many visual gags and puns. As a result, it can be challenging, but fun, for a viewer to keep up with the show's rapid-fire pace. The show also features a narrative story line that sustains the action of the series throughout its entire run. Though Arrested Development has been off the air for some time, its popularity has increased dramatically thanks to televised reruns and sales of the DVDs. People have grown to love the Bluths, and many of them wish that there were new episodes to watch. Thankfully, the show is set to return shortly with a ten-episode fourth season which is still in the developmental phase. For fans of the Bluths and the hilarious comedy that they have brought to television screens, this is outstanding news. In the meantime, fans can continue to be entertained by Arrested Development by watching it online, in reruns or on DVD. George-Michael is having a hard time balancing his business and reconnecting with his father. Buster has a hard time making it on his own away from his mother. Things heat up at UC Irvine when George-Michael finds himself in a love triangle with his best friend Ray and his girlfriend Becky. Maeby moves out and reconnects with her cousin George-Michael. Gob takes on a job from his brother, but is distracted by his own plan. Lucille realizes her children have already started dividing up her things, and tries to get used to her new home. Lindsay continues to search for herself by seeking a relationship and finding a new career. Gob makes new friends after his relationship falls apart and his family abandons him. George Sr.'s latest business experiences some problems resulting in bribing a politician in order to get his scam back on track. Tobias tries to find meaning after splitting with Lindsay, but realizes that old habits die hard. Michael is faced with a life changing business opportunity. Unfortunately, he needs his family's consent. Lindsay tries finding herself again through traveling and getting back to her political activist roots. George Sr. tries putting the family back together by drumming up a get rich quick idea. Michael starts his own business after leaving the family one. The mailman Pete dies causing havoc in the family. Bateman appears to defend Jeffrey Tambor's abusive behavior. Jason Bateman will return for the series' fifth season. This is not a huge mistake. In an acknowledgment of the changing definition of television programming, the Emmy Awards handed out nominations this week to programming from non-traditional sources. Already enamored of cable TV programming, the Emmys this year opened their arms to several series produced exclusively for the internet. "Arrested Development" adds the "Office" star to their long list of upcoming guest appearances. 'Arrested Development' Gets a Release Date! "Arrested Development" fans finally know which day to tune in to Netflix for the long-awaited season four! Show creator Mitch Hurwitz tells anxious fans that an "Arrested Development" film is definitely in the works... but first, season four must lay the groundwork. The "Saturday Night Live" actress and "Knocked Up" comedian are just a few of the names signed on to guest star in "Arrested Development," which has been saved by Netflix and will be returning in spring. Amber Tamblyn and David Cross Wed! Long-time pair Amber Tamblyn and David Cross have finally married, after falling in love on a connecting flight three years ago. Arrested Development is currently available to watch and stream on Netflix. 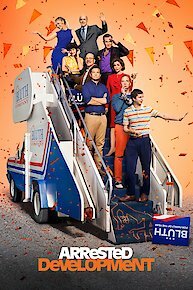 You can also buy, rent Arrested Development on demand at Netflix, Amazon, Hulu, Vudu, FandangoNow, Google Play, iTunes online.